Alexander Stuart as Christopher in Florida Studio Theatre's The Curious Incident of the Dog in the Night-Time. 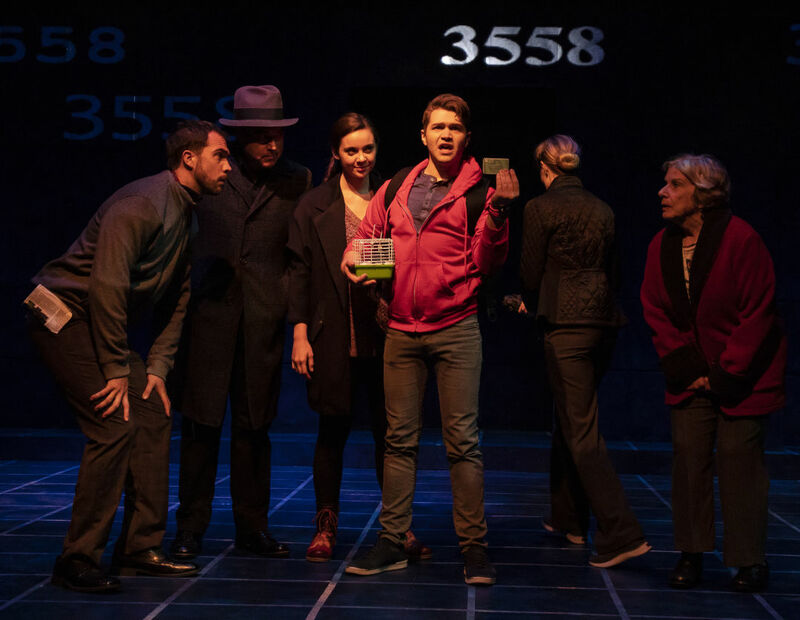 I’ve been “curious” to see Florida Studio Theatre’s production (a regional premiere) of Simon Stephens’ The Curious Incident of the Dog in the Night-Time ever since it was announced as part of the season. I had read the book by Mark Haddon some time ago, and productions of the stage adaptation both in New York and London had received high praise. Christopher has been living with his father Ed (Todd Licea) in Swindon, England, going to a special school where teacher Siobhan (Ashton Heyl) understands his special needs and helps him deal with his condition while encouraging him to write frequently in his notebook. The pages start to really fill up when a neighbor’s dog, Wellington, is found dead, speared by a big gardening fork, in the back yard. Christopher was fond of Wellington, and is attracted by the idea of solving the mystery. That involves talking to his neighbors, including Wellington’s angry owner (Liz Power) and a kindly older lady (Ann Gundersheimer), which is hard for Christopher. Beyond that, his investigation soon gets him into trouble with the local police and with his father, his sole caregiver in light of the disappearance of Christopher’s mother (Rachel Moulton). But the truth about his mother and other truths, too, begin to surface, leading Christopher on a solo journey to London that tests him in ways it takes great courage to face. Stuart (who himself is on the spectrum) portrays Christopher engagingly without ever playing up to us. Christopher is difficult to handle; he can’t be touched, doesn’t like to look anyone directly in the eye, tugs and twists the strings of his red hoodie or scratches himself, tics of his condition. But he is bright, and he is determined, traits that may just help him overcome the obstacles in his path. Heyl as the sympathetic Siobhan, Licea as the hard-pressed father, Ed, and Moulton as a mother driven nearly frantic dealing with Christopher’s needs all support Stuart and help to convey what it must be like in the situation. Other cast members switch ably between multiple characters including a priest, policemen and fellow commuters on Christopher’s trying railroad journey. 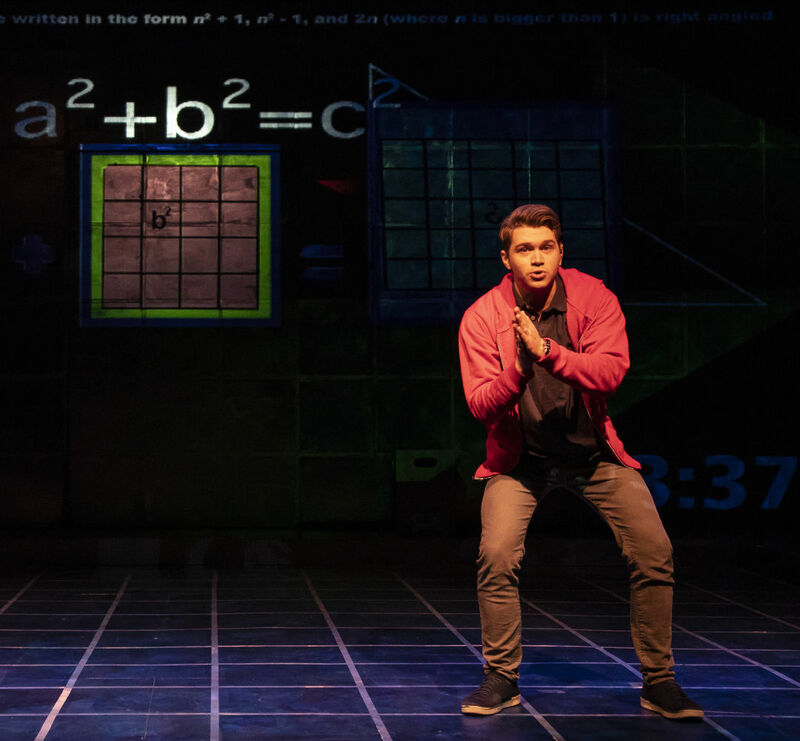 That journey is one of the highlights of the production, utilizing the projections of flashing numbers and words, the almost overwhelming (to Christopher) sounds and lights and the movement of the railway carriage or a subway car to take us along in his mind. Sometimes the action goes by in too much of a rush, perhaps, but in general we are swept up in Christopher’s story and his world. And we are rooting for him to succeed. 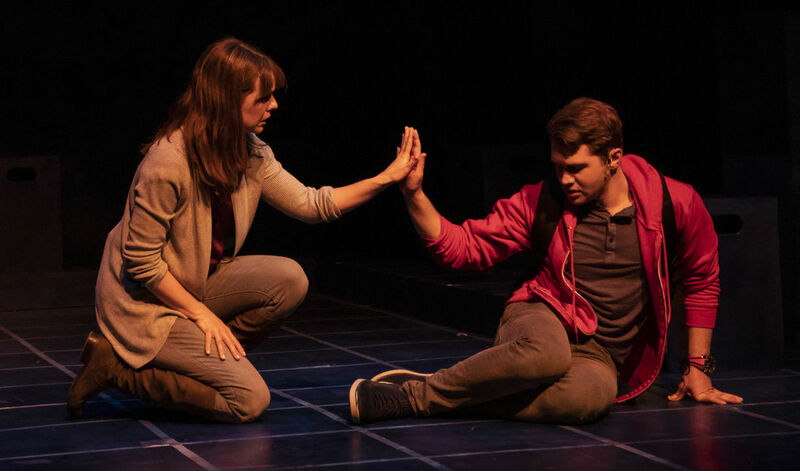 The Curious Incident of the Dog in the Night-Time continues through March 24 in the Gompertz Theatre; for tickets call 366-9000 or visit floridastudiotheatre.org.